Amangani in Jackson Wyoming is AMAzing, an elegant mountainside hotel near Jackson Hole skiing. This four-diamond property treats skiing families like gold, from the gracious welcome and superb service to the spacious suite lodging with the most modern amenities in a western motif. 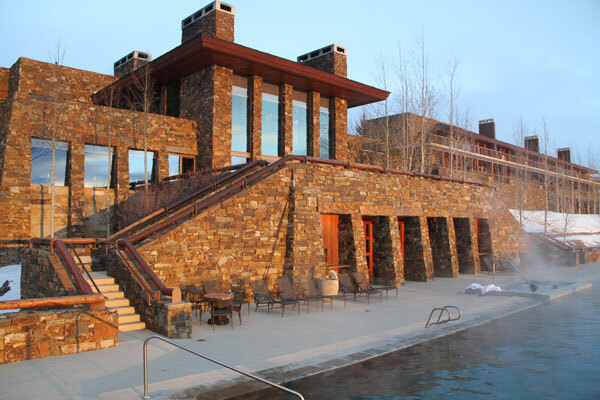 This new west hotel is architectural amazing, it blends into the hillside overlooking the Grand Tetons with beautiful stonework, while the inside lobby is grand with soaring ceiling of rich redwood. Amangani’s outdoor heated pool and hot tub are spectacular, from the view of the mountains and the grazing elk not far away, to the full service spa treatment of fluffy robes and towels. Ski valet chauffeurs you to the slopes in the courtesy shuttle, to Amangani’s exclusive Ski Lounge in Teton Village, where your family’s ski gear is stored and snacks are available at the base of Jackson Hole’s inimitable slopes. If you prefer a day away from the slopes, the Amangani wildlife safari will take you to the National Elk Refuge and Grand Teton National Park to see elk, moose, bison, and bighorn sheep. Or go explore the great cowboy town of Jackson for shopping and western art gallery hopping – including a visit to the National Wildlife Art Museum. Apres ski, the grand fireplaces in Amangani’s luxurious lobby are lit for you to enjoy a cocktail, or sit by the swank Zinc Bar while the kids play games or watch DVDS in the leather couched library. All these stunning gathering rooms have great views of the ski slopes and The Grand Tetons, plus the elk poking their antlers up on the hillside below. The cuisine at Amangani Grill is elevated like the hotel at 6,000’, a James Beard award-winning chef prepares fanciful plates of Wagyu beef, trout, bison, and elk for your dining pleasure in the elegant fireside restaurant. Kids menus are available with less exotic fare. Amangani is part of Aman Resorts, a collection of luxury resorts around the globe with 31 locations in 20 countries including on the ski slopes at Aman Le Melezin in Courchevel France. You may become an Amanjunkie, an Aman Resort connoisseur, after your stay at Amangani Jackson.